Nikon’s first AF-S super-telephoto zoom lens to feature VR image stabilization, the AF-S VR Zoom-NIKKOR 200-400mm f/4G IF-ED has empowered sports and wildlife photographers to bring home some of their most amazing shots yet. Its superior NIKKOR optics and Nikon’s advanced lens technologies deliver consistent, exceptional performance, even on the most challenging assignments. How will it inspire you? The AF-S VR Zoom-NIKKOR 200-400mm f/4G IF-ED combines the reach and functionality of four super-telephoto prime lenses into a single compact super-telephoto zoom lens. Its broad focal length is complemented with Nikon’s VR image stabilization for enhanced low-light performance—shoot at shutter speeds up to three times slower than would otherwise be possible. 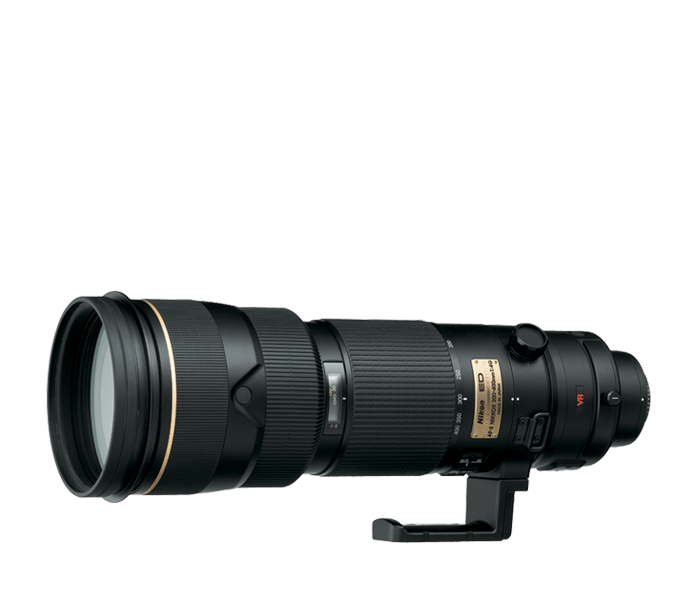 The world's first AF-S VR super-telephoto 200-400mm zoom lens employs a host of Nikon's exclusive technologies to deliver spectacular images. Besides its two VR modes, the AF-S VR Zoom-NIKKOR 200-400mm f/4G IF-ED automatically detects when you’re panning and compensates accordingly. Silent Wave Motor (SWM) enables ultra-fast, ultra-quiet autofocusing with seamless manual override. And 4 Extra-low Dispersion (ED) glass elements minimize chromatic aberration and provide higher resolution and superior contrast.